Benefits of aloe vera: An aloe vera has a lot of benefits so that it is also called "Wonder Plant" also. 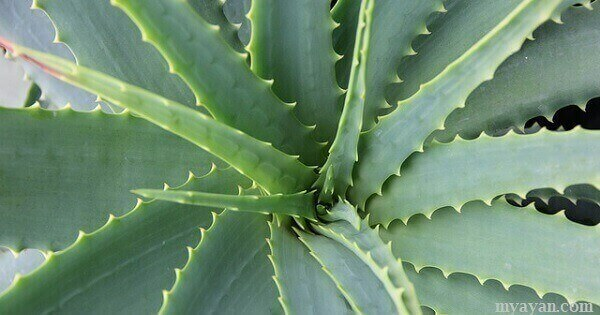 Aloe vera is a plant which contains the bunch of leaves. These leaves are thick and contain a gel-like substance inside. This gel of aloe vera leaves is the main thing which makes aloe vera very popular throughout the world. If this gel is applied to the skin it makes us feel cool and because of this quality of aloe-vera gel, most people use it at burned skin or wounds to cure them and get very effective results. Aloe vera can be found in many forms in the market for example gel, juice cream and shampoo. Whatever is the form of aloe vera a person uses, it always benefits the body but according to many Ayurveda acharyas/or doctors the best form of aloe vera to use is "Gel". Although you can get a lot of aloe vera gel products in the market but the best way to get the gel is cut the leaves of aloe vera from the plant and further cut the leaves in pieces, you will see green and outer most part of the leaf covering a colourless, smell less and test less substance. And this is what we were looking for "aloe vera gel". Here it is important to mention that aloe vera can be grown anywhere very easily so one can grow it at home also and can take the benefits of it and can make it all packs at home only which will be pure and safe for using instead of buying from the market. What the aloe vera is best for:- According to most researches aloe vera is best for hair and skin. Next, in the article, we will learn about the benefits of aloe vera and the methods of using it. Aloe vera is widely used for skin care as a face was and in the form of the cream. While you use aloe vera cream do not use other creams intentionally. It can harm your skin instead of being benefiting from it. It is also used for the treatment of burnt skin but we should also use clinical aid first for the burnt place and then after aloe vera can be used for relief at the burnt place. Simply just applying a pack of aloe vera on the skin every day will make your skin brighter and smooth. It also cures itchy rashes and other skin problems of the skin. Aloe vera contains vitamins A, C, E and B-12, it also contains folic acid too. These all vitamins are very beneficial for the health of hair and the head scalp. These all vitamins are very helpful for growing new cells on the scalp, its gel-like substance clean scalp deeply and remove dandruff and the result is stopping falling of hairs and conditioning them with aloe vera hair start growing fast and healthy. To get this benefit just apply the aloe vera gel on the scalp for a duration of 15 to 30 minutes or just use aloe vera shampoos or conditioners to wash hair or use as per the instruction is given on any product if using any branded product. It keeps body ph balanced which helps us in keeping healthy in many ways. As aloe vera have 96% water in it juice so drinking it prevents dehydration. Our liver is responsible for detoxification of our body and for this process adequate quantity of water in our body is needed. Aloe vera juice is very helpful for keeping body hydrate and our liver works properly and so both our liver and body stay healthy. Drinking aloe juice remove constipation and increase water content in the intestine which protect us from stomach related problem. Aloe vera juice helps in removing acne problem in a great way. Some researches claim that it also cures psoriasis too. Aloe Juice is very rich in nutrition, it contains vitamins A,C,E, B-12 and folic acid. It is important to mention that aloe vera is the only plant which is a source of Vitamin B-12. One should not drink too much aloe vera juice or daily without consulting any Doctor or Ayurvedacharya as it has some side effects too which can harm you instead of benefits. If one is under any treatment of any disease do not use aloe vera, as its contents can react with the medicine and harm you. Before using gel, take a little amount and apply it on the opposite side of your palm if it feels itchy at that place after some time of applying, avoid using aloe vera.